UCSF Benioff Children's Hospital Prom - another chance to give back! Many years ago, my daughter was going through ongoing treatment at UCSF Benioff Children's Hospital for her Crohn's Disease. It was at that time that my wife and I offered to volunteer for their annual prom. And once again this year, I had the honor to photograph this amazing event for them. If you have followed the blog for a while now, you will likely remember seeing a post from this event each year. Why? Because these kids are just amazing. Each one of them has been in the hospital for treatment, many of them for serious diseases, but they show up to this prom and show just how happy they can be. This shot was taken using my fish eye lens. I stood really close to the sign so that it would be bigger in the final image. But in the background, you can see the red carpet that was put out for the kids. This year's theme was masquerade, and the decorations were perfectly suited for the event. I got to the event about an hour early, to take detail shots and get the lay of the land. I saw these two ladies all dressed up and asked them if we could do a photo. As the kids arrived, they were checked in by the volunteers. Just like the previous years, the kids were given corsages and boutonnieres as they entered. And like the last couple of years, there were 8 of the San Francisco 49er players who volunteered their time to be a part of this year's prom. The 49ers had their photographers and staff on hand for photos as well. How awesome do these kids look in their clothing, masks and flowers? The players took turns escorting the kids to the dance area. The kids really loved mingling with the NFL players, and the players were having a great time too. In this photo, I took just a small portion of the prize table, but you can see the quality of the give-aways. Again, many of these items were donated by the companies. You know when you have NFL players in the house, you are going to have a lot of selfies happening. I love this shot of Marcus Ball posing with these two girls. I showed it to Marcus after I took the photo, and he loved it. Using the WiFi feature of the Canon 5D Mark IV, I was able to transfer it directly to my iPhone and then Airdrop it to him right there on the spot. Very cool. One might think that dancing with all this connected to you would dampen the mood for this young lady, but nope! She had a big smile all night. At one point, she motioned for me to come over to her. She held up her phone, in which she had typed out a couple of song requests. and I made sure that the DJ had that covered. This is one of my favorite photos from the night, showing Pierre Garcon (formerly with the Washington Redskins) partying with the kids. He was out on the dance floor all night with these kids. As in previous years, I love capturing photos of the hospital staff interacting with the kids. Everyone is on the dance floor, regardless of wheelchairs, IV poles... As I mentioned, this is one inspiring event to photograph. Did I mention that there were a lot of selfies happening during this evening? Even the players were having fun capturing the moment. In a time when there is so much negative press about players in the NFL, it sure was nice to see these guys give everything they had to these kids. When I teach photography, I always talk about capturing the emotions. Well...as you can see from these photos, these guys were truly enjoying themselves. There is no faking these smiles! This photo was taken by Amanda Halbakken. She is an aspiring photographer friend of ours, and she was helping me out for the night. I was teaching her during the event, and she did a great job. I love this photo with one of the SF 49ers towering above the crowd. Too funny. I saw this young lady who was using one phone to light herself and the other to capture a photo. I just had to get a shot of that. I also saw this girl looking intently at her phone. Seeing the glow of light on her pace, I quickly turned off my flash, and grabbed the shot using only the ambient light in the room and from her phone. It turns out that the two ladies I photographed earlier in the evening, were amazing artists, who decorated the kids. For all the healthy kids out there who stress about the little details of their prom (shoes, dress, transportation...), I welcome them to look at this photo and realize how fortunate they are. Towards the end of the evening, they had a drawing and the many of the kids received their prize packs. At the end of the night, each kid is given a sweatshirt, and they really loved them. The kids also took home photos of themselves with the 49ers. At each prom, the hospital has a quiet room where the kids could hang out. In this rooms, they had the body painters, popcorn, and a giant black board where the kids could leave a note. I love their messages. If you read them, you can see how much they appreciate the efforts of the volunteers and hospital staff. The last dance was a slow song. I jumped up on the stage and took some final photos of the kids. I looked around the room to find the right subjects, and saw these two enjoying that moment. A perfect ending to a great night. As I do each year, I waited until all the kids had left and the volunteers had a chance to come together. I would like to personally thank each of these staff members for everything they do. They worked tirelessly to make this evening a success. And here are all the others who made this possible. Kudos to them! As I was leaving, Caitlin, my contact at the hospital, said that I better make sure to be available next year, and my answer was "I would not miss it for the world!" Printing my images on the Canon Pro-1000 printer using Hahnemühle paper - Testing ALL different papers to see the results! 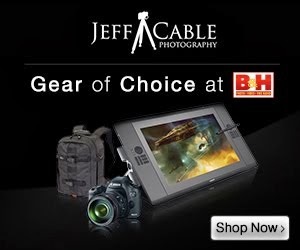 A couple of months ago, I was at the WPPI trade show in Las Vegas. In between my presentations, I walked around the show floor to see if there was anything new exciting. Keep in mind, I am at different photography shows throughout the year and so I see a lot of the same things each time around. One booth that really captured my attention, was Hahnemühle. This is not to say that they have not been at other shows, but I have never had the chance to really stop and spend any time to truly investigate their papers. As you can probably tell from their name, they are a German company. It turns out that they have been making paper for more than 400 years. So...why was I so excited about paper? 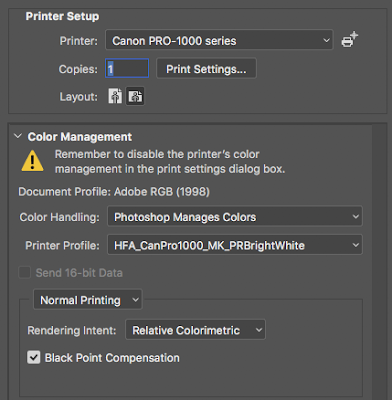 The answer to this question is, I print a lot of my photos on my Canon Pro-1000 printer and really want to print on the best quality paper I can find. Canon has good paper, but pretty limited options for paper types. What I saw at the Hahnemühle booth really impressed me. They had a wide selection of paper, and all of them showed the images at their best. The first thing that I did, was get the three different sample packs that Hahnemühle offers. They have the Glossy FineArt pack, the Matte FineArt - Smooth pack and Matte FineArt - textured pack. Having all three of these effectively gave me every paper option they offer. The samples are all in 8 1/2 x 11 size. I decided that the best way to test the look of each paper, was to print the exact same image on each type of surface. Since I had just returned from our safari workshop in Tanzania, I used one of my favorite photos as my test shot. I chose this image because the photo had a good combination of detail, color, grey scale and texture. I also printed one or two more colorful images to see what they would look like as well. I was very happy to see that Hahnemühle has all their ICC printer profiles on their web site. 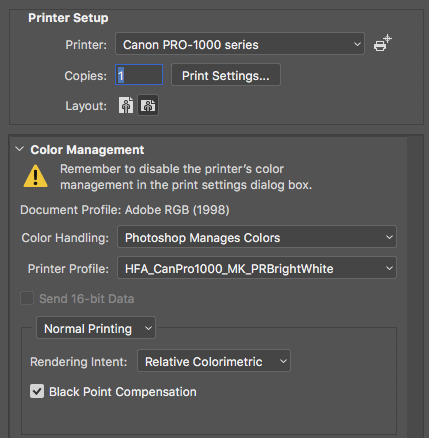 This is critically important, since these profiles are vital to make sure that your printer is laying down the right amount of ink, and at the right distance from the paper. I downloaded the printer profiles from their site and it was easy to print my samples using those profiles. It took some time to print all of the sample images, but it gave me a chance to compare each paper type and determine my favorites. These papers differ in their texture, glossiness, thickness and brightness. And in my tests, I felt that there was no one perfect paper for every image. Some photos looked better on a matte paper while others looked stronger on glossier paper. Some looked good on a whiter paper, while others looked better on one of the papers that were more off white. Once I had determined my favorites, it was time to get some packs of the larger sheets of those papers. Of course, my favorite part is powering up the Canon Pro-1000 printer and printing some of my images on really high quality paper. And the bigger, the better. Wow - these prints look so good on this paper! Here are some prints, which are being sold on my online gallery. I tend to use the more textured matte papers for my monochromatic images, and the bright and pearl papers for my more colorful images. For the first 5 years of my photography business, I did not print any of my own photos. I relied on Bay Photo for that. I still use Bay Photo for albums, books and other specialty items, but love printing my own images in my home studio. I love the immediate satisfaction of taking a photo, and then right after, seeing that image in print. There really is no substitute for that! For all of you looking to print your photos on high quality paper, I encourage you to get the Hahnemühle sample packs (links are above) and try these for yourself to determine your favorites.